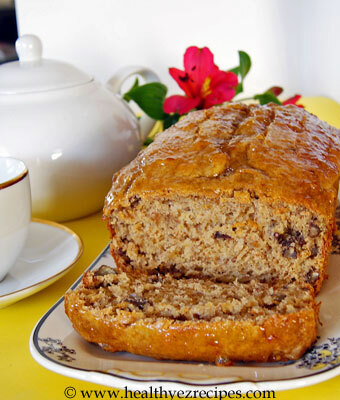 If you like to spice up your banana bread then this recipe is just what you need. The sweet and the spicy are combined to create a beautifully tasting loaf that will delight everyone. Spices like cinnamon, nutmeg and ginger complement bananas so well, giving a hint of spice without being overpowering so you still get that banana taste. Add to this a beautiful glaze of orange marmalade and you have a banana spice bread that is worthy of being called a family favourite. We've also managed to keep it healthy and low fat by using yogurt and sunflower oil and cutting back on the sugar. Grease a 9 x 5 x 3 inch / 23 x 13 x 7 cm loaf pan, line base and two long sides with baking paper. 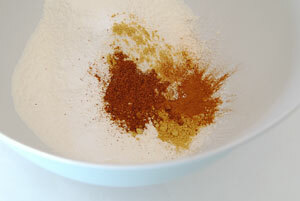 Sift together the flour, baking soda and baking powder into a mixing bowl. Add the ginger, nutmeg and cinnamon and brown sugar and stir with a whisk until the all the ingredients are thoroughly mixed. Sometimes brown sugar can be a bit lumpy, so keep stirring until all the lumps have disappeared. 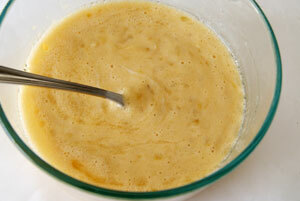 In a separate bowl mix together the yogurt, vegetable oil and the beaten eggs. Stir until well combined. Peel and slice the bananas and mash with a fork or a potato masher. 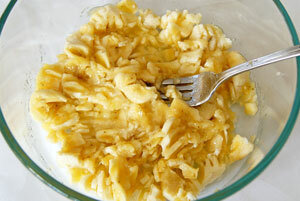 Add the bananas to the egg mixture and give another stir. 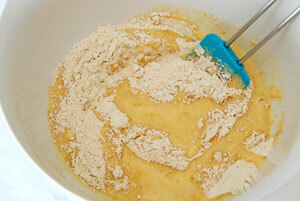 Make a well in the center of the flour mixture and add the banana mixture. Using a rubber spatula gently fold the banana mixture into the flour mixture until they are almost combined. Then add the chopped pecans. Continue stirring only until there are no traces of flour then stop. Overworking your mixture will result in a tough loaf. Pour the batter into the prepared tin and spread out evenly. Cook in a moderately slow oven 160°C / 320°F for about 1 hour, or until cooked. To test if your loaf is cooked insert a wooden skewer in the center. It should come out clean. Remove from the oven and leave the loaf in the pan for 5 minutes. 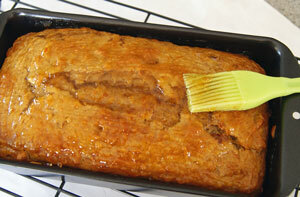 Warm two tablespoons of orange marmalade in the microwave and brush the top of the loaf. TIP: If you don’t have marmalade, apricot jam would be fine. When cool enough to handle, turn the loaf out onto a wire rack and leave to cool completely. This recipe is best made using over-ripe bananas, that is when brown spots appear on the skin.